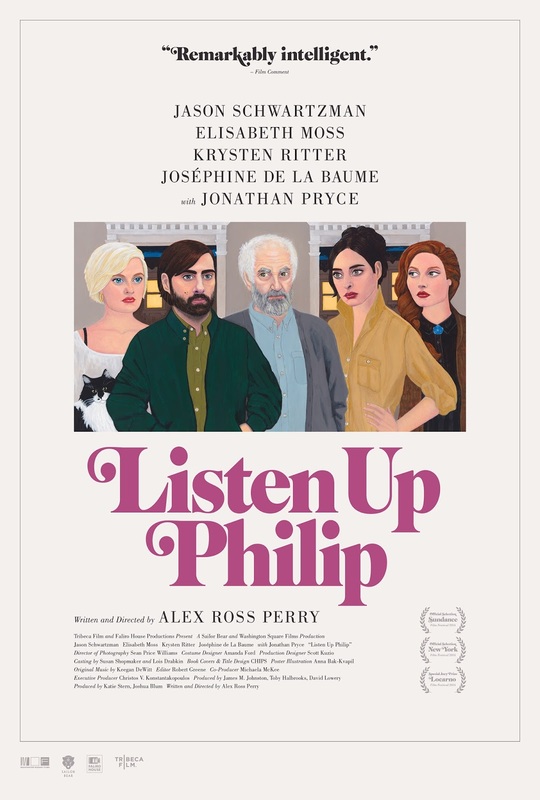 "I've Been Sitting Waiting To Make a Scene for Hours"
Alex Ross Perry's new film Listen Up Philip is just the kind of film I used to enjoy catching at an earlybird screening at the Curzon: I'm not particularly excited to see the film and don't think it's worth £15, but could have been tempted for £8. Instead, I paid a tenner to catch it on Curzon Home Cinema, which I am now regretting. Not because I hated the film, but because it was just tedious enough that I started multitasking while I was watching it on Sunday night, which meant I had to watch most of it a second time on Monday. I don't think this has made me think of it more fondly. Jason Schwartzman stars as the titular Philip, a 30-something writer on the verge of publishing his second novel, Obidant. To describe Philip as egomaniacal, arrogant and crushingly irritating is to state the obvious, and nor does it distinguish him from the film's other characters, none of whom is much more likeable. There's his girlfriend Ashley (Elisabeth Moss), a successful photographer with whom we start to sympathise after Philip swans off to spend the summer at the home of a Philip Roth-like writing god, Ike Zimmerman (Jonathan Pryce). Zimmerman himself is a cad of epic proportions, isolated from his seething daughter (Krysten Ritter). The poster bills Listen Up Philip as Woody Allen meets Wes Anderson, and yes, the font on the poster is there, the music is there and even the vintage-inspired cinematography is there, but the film has too little heart and too much discomfort to be as enjoyable as anything by the two WAs. That isn't to say that I disliked everything about it — there are some great zingy lines in the script, especially the putdowns ("what's the problem?" / "She didn't like your book") and the self-aware self-centredness ("I've been sitting waiting to make a scene for hours"). Moss's performance is another of the film's strong points: her character is often overshadowed by Philip, of course, but Moss's Ashley is nuanced, complex and much more interesting. I couldn't warm to Schwartzman's Philip, though; not even a little bit. The opening scene, where Philip meets with an ex-girlfriend to give her a copy of Obediant and to explain to her, at length, how successful he is, is up there with The Social Network in the awkward-scenes-at-the-bar stakes. The characters walk around the city, irritating and screwing over one another. Nothing really happens, and that is part of the problem: Listen Up Philip was at least 30 minutes too long, and the final act really dragged. Meanwhile, doleful trumpet solos only servs to remind you that you would much rather be watching Chinatown. Or something fun.